We all love to eat south Indian food once in a while, don’t we? Sitting at a south Indian restaurant and thinking what to order; one thing that we are sure to try is the savoury, tangy tomato chutney. Although different restaurants have their own recipes of tomato chutney, here is my mom’s super hit tomato chutney recipe that she makes quiet often at home. 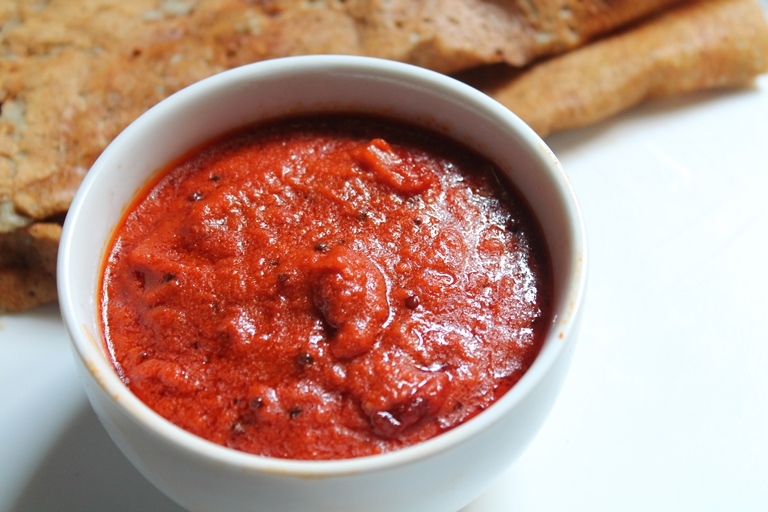 This tomato chutney is different from the regular chutneys. My mom uses it as a pasta sauce (of course, without the coconut and curry leaves), as a sandwich/wrap spread, and even as a pizza spread. She has followed the bare-bones of the original recipe of tomato chutney and added a little twist. You can pair this chutney with anything you want. And, what makes this tomato chutney recipe so special is the roasting of the pepper, which brings out the flavour to die for. However, the taste of the chutney may differ at times, depending on the tanginess of your tomatoes. So, here is my mom’s special recipe of tomato chutney. Take a pan and toss the veggies with olive oil and rock salt (as per taste). Roast the veggies in the pan at very high heat until the skin of the veggies gets softened. Now, place the veggies in a covered container and allow them to cool down. Once it is done, remove all the blackened skin from the tomato and the pepper. Now, take the pulp of the pepper and tomatoes and mix it well with all the other ingredients and a tablespoon of olive oil in a mixer till you get a smooth paste. Your delicious restaurant-style tomato chutney is ready to be served. Happy cooking!